This post represents another installment in the series detailing the first of our three cross country National Parks camping trips. 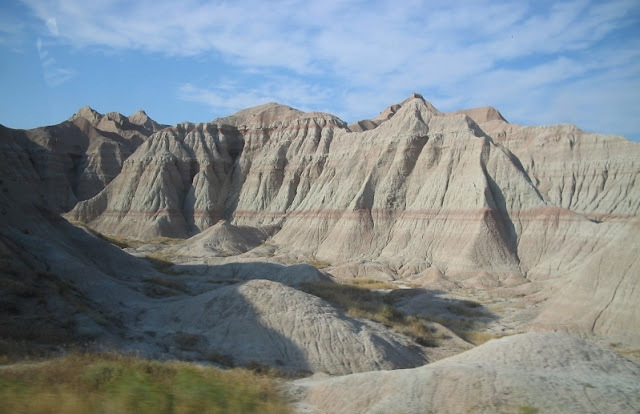 Upon leaving Minnesota, we headed west into South Dakota where we would visit the Badlands (link HERE), the first of the National Parks on our list, as well as the Mount Rushmore National Memorial, the Crazy Horse Memorial and Custer State Park. Alan and I had made this trip once already – on our honeymoon many, many years ago. We would now be entering territory we had already traveled and we were both looking forward to sharing this journey with the kids. What would they like? What would they not? Would they find themselves under the spell of our National Parks just like two young honeymooners did so long ago? We were about to find out. Now the Badlands are not a place that we’d enjoy spending a whole lot of time in during the hot summer months. We were traveling in August and had decided that this would be more of a “drive through” visit than a “let’s stop and really get to know this park” visit. (We do both, depending on the Park itself and the time we have allotted for the trip.) The year was 2007, so our kids had cameras, but not smartphones yet. Our son was 13 and our daughter was 8. 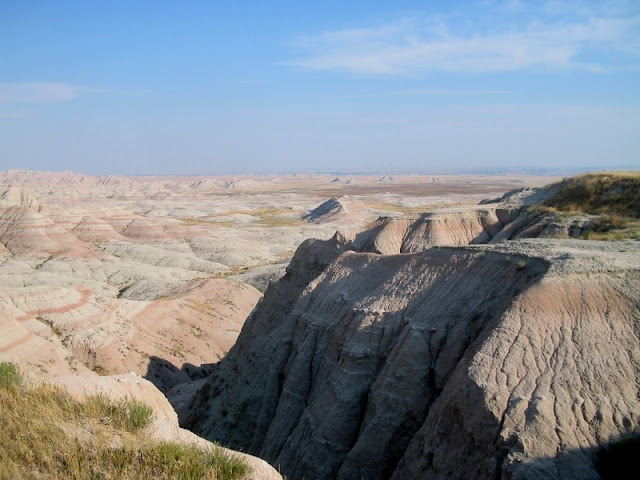 As we entered the Badlands, Alan and I started hearing what we considered to be music to our ears – numerous exclamations of “Oh, wow!” immediately followed by countless camera clicks. (Thank heaven for digital cameras!) As we paused at the pull offs to admire the rock formations and the long, long views off to the horizon, it was quite clear that we had just added two more National Parks fans to our family – and we couldn’t have been happier. Badlands National Park certainly impressed the kids! So, I know what you’re wondering . 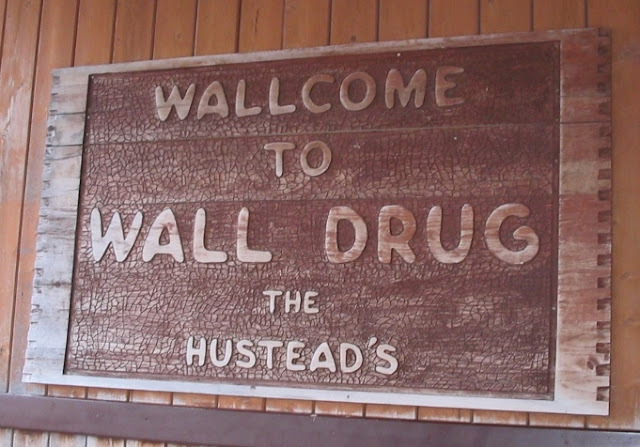 . . Did they or did they not stop at Wall Drug in Wall, South Dakota? Of course we stopped at Wall Drug (link HERE)! Listen, we love the great outdoors but we realize that there is more to life than just our State and National Parks. Alan and I have always enjoyed traveling and exploring all different kinds of places. Our kids were just starting out on that path and we knew they would be forming their own opinions on travel based upon this trip – their first epic journey of discovery. So, the more experiences, the better. In fact, Alan and I remembered stopping at Wall Drug on our honeymoon! Wall Drug is a kitschy little tourist destination just outside of the Badlands. It’s funny – some people love it and others can’t stand it. (Different perspectives – they certainly make the world a more interesting place, don’t they?) Wall Drug was thriving when we were there all those years ago, providing a welcome break from the long stretches of open road for many travelers. It was still thriving when we stopped with the kids. After enjoying the requisite glass of “free ice water,” a quick meal and a walk around the gift shop we continued west toward Rapid City and the Mystery Mountain Resort. Mystery Mountain (link HERE) was a good stop for us – a nicely wooded campground close to Mount Rushmore and the Crazy Horse Memorial. It was a well-positioned home base for our visit to the Black Hills of South Dakota. 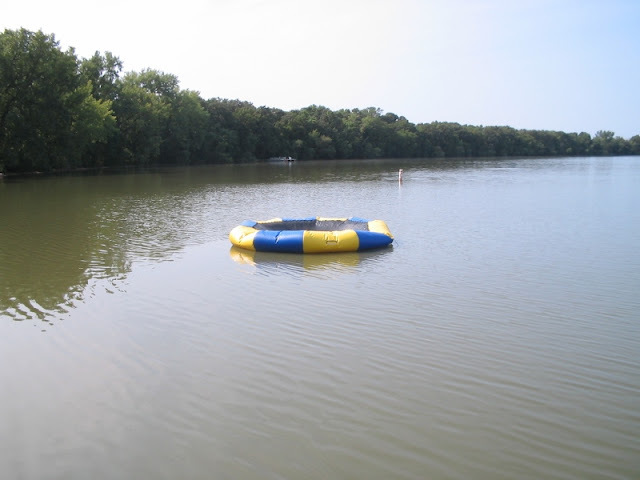 Plus, it’s a participating campground in the Good Sam program and offers a discount to Good Sam members. We arrived at Mystery Mountain after dark – never any fun in my book – and settled in quickly, looking forward to the next day’s visit to one of the icons of the National Park system - Mount Rushmore National Memorial. What would the kids think of that?! We couldn’t wait to find out! I’m hoping that this series of posts about the first of our three cross country National Parks trips will give you a feel for life on the road and traveling for an extended period of time with kids in tow. With luck, it will provide you with some food for thought about places you might like to add to your Bucket List (or avoid entirely! ), potential campgrounds to visit and attractions to research should you find yourself in the same neck of the woods. Please do come back again for future posts – it’s a pleasure to have you along for the ride! Wall Drug, now that brings back some of my own fond memories of cross country trips. We made a short stop over there- in the early 1960's. I think I was 9 or 10 and my brothers 8 and 6. We have some great black and white photos of us playing on dinosaur statues and posing with the " cigar store Indian" that was stationed at the front door to a shop. Travel by car across the USA is one of the best ways to get to know our great country. Agreed! We're hoping that the photos of our National Parks trips will bring back the same kind of fond memories for our kids years from now.